Colorful crochet patterns are always popular and the colors of the rainbow are a particularly fun choice. Brighten up your home and your wardrobe using these free rainbow patterns. Although rainbows may make you think of children or boho style, you'll discover a wide variety of design options in rainbow shades of yarn. This crochet square pattern has such a smart design. 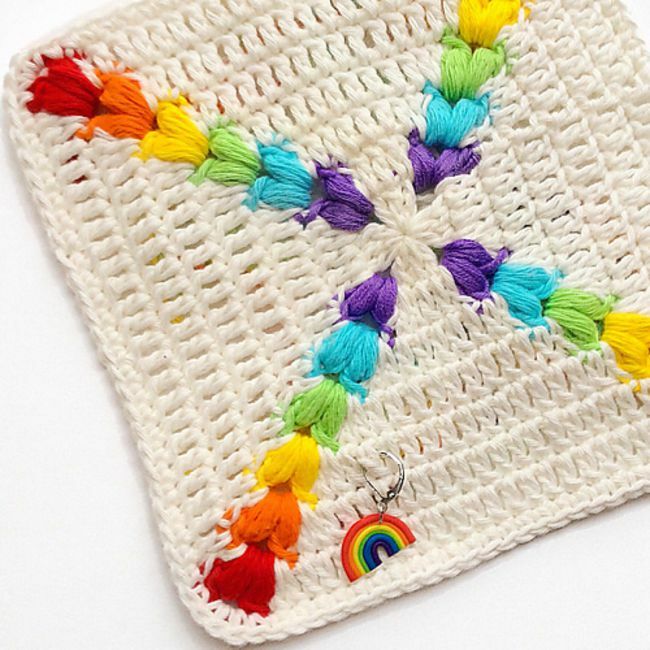 It is a very simple white square except with textured puff stitches worked into the corners to create rainbow stripes radiating out across the design. The pattern creates an 18 cm square; mix and match with other squares to create shawls, blankets, and other motif-based projects. The designer also offers a rainbow puff hexagon crochet pattern. Change colors every few rounds to create a large crochet granny square blanket. This one has some added detail to the design with a second rainbow as a large striped border. The final edging is a picot-inspired bobble. This design uses a neutral color for that edging; use white for a more chic look or black to really make the rainbow shades pop. Find another version of a rainbow granny square blanket over at Zeens and Roger. It is mostly a white granny blanket with a rainbow edge. Make someone's birthday special with their very own long-lasting crochet cake. This one has rainbow stripes that bring pops of color to the celebration. Add the smiley face for extra cuteness or leave it off for a more sophisticated design. If you like cake slices more than a whole cake, check out the rainbow cake pattern from Hobby Craft. If you really want to challenge yourself with a rainbow crochet project, look no further than this one that incorporates more than 100 different colors of yarn! The colors are organized into the shades of the rainbow. Within each color there is an ombre effect; varied shades of red and pink create an ombre for the red section of the rainbow, for example. The stitch pattern is intriguing to the eye but easy once you've learned how to do it. This is a bilingual crochet pattern. This crochet pattern also uses several hues of each color to create an ombre within the stripes of the rainbow. Rows of black and white help those bright colors really pop. The chevron striping is simple and this jacket has easy construction. Learn how to crochet the granny stitch in the round as a spiral for this really fun dreamcatcher pattern. Use yarn wrapping to attach the pattern to a round hoop for hanging and display. Change colors strategically to get the rainbow pattern. Rainbow patterns are great choices for spring accessories since the season is so bright and colorful. This cowl adds a little warmth and a lot of color to your clothing. The recommended yarn (a lovely merino/nylon/silk blend) is called Rainbow Love Yarn; the yarn does all the work for you so you get the rainbow without having to change colors. This designer also offers a rainbow infinity scarf pattern in the same yarn. Rainbow patterns are a popular choice for bohemian style and other clothing worn at music festivals. The crop top is a staple of those types of events, and crochet is also popular in that fashion arena, so a rainbow crochet crop top is really the perfect choice. This one is built so that the rainbow takes up the entire front of the top. The colors chosen here are a lighter, pastel version of the rainbow. Wear a rainbow hat during any time of the year, especially when you've been feeling down and need a bright little pick-me-up. This crochet beanie has a heart appliqué on it for extra love. It can be worked as a messy bun hat or as a solid beanie. The pattern is worked in a self-striping rainbow yarn which means no color changes for you and no need to purchase seven different skeins of yarn to get the colors of the rainbow. Dress up your home with rainbows starting with this solid basket pattern. Use it to store your yarn, magazines, or any number of other items in the house. Something interesting you'll notice is that the pattern uses all of the colors of the rainbow but not quite in the traditional order; play around with changing colors in this way to create different effects.